Virtual Health Service: How VR Is Helping Patients Face Their Fears - Augmented Reality, Virtual Reality & Mixed Reality services in Chennai, India. There is a tree growing in the middle of a shopping mall. Apples, red and ripe, hang on its branches. Tentatively, you reach out and take one, before dropping it in a basket sitting by your feet. Or rather, where your feet would be. As you look down, your stomach wrenches as your brain tries to comprehend how you can be so high up, standing on a tiny platform, picking fruit from a tree that’s hovering in the air. That’s what you would experience if you picked up a VR headset and stepped into Fear of Heights, a virtual reality treatment being developed by Oxford VR, a company supported by the University of Oxford, which works with the UK’s National Health Service to treat acrophobia. The idea is to provide patients with a greater degree of personalization that they could practically get in reality. The experience starts from just a small height, perhaps a few inches off the ground, as participants step onto the platform and pick apples. As they grow more comfortable, the height can be adjusted to multiple stories. The virtual world built by Oxford VR is heavily stylized; no patient would mistake it for real-world experience. But, in some ways, that works in its favour. The patients know on a conscious level that they aren’t really standing on the edge of a building, for example, but their brains still react to the perceived height in the same way—and that’s where treatment can begin. NHS, meanwhile, is currently dealing with financial constraints, so treatment inside a VR headset is much more affordable than constructing or renting a 10-story shopping centre for acrophobics to hang off of. A good VR-compatible PC and headset are also more portable and can be taken to those who might also struggle with social anxiety or psychosis. Gage likens the experience to a video game; there’s a dialogue tree the patient will go down, hitting various cues as they have a “conversation” with their virtual counterpart, though voice recognition is not yet supported. Gage goes back to a video game comparison to illustrate this point. While in a video game, you know what you’re going to get out of a character. Whether it’s the non-playable shopkeeper exchanging goods, or the farmer who exists to provide you with a quest, you can “go through the motions,” and, to an extent, ignore the fidelity. But when a patient is really focusing on a virtual character, and the character acts strange, it could ruin the entire experience. As such, tiny behavioral changes—like randomizing how often a non-playable character blinks or having them turn to look at you as you move within the virtual space or glance at you if they’re in your peripheral vision—can be the difference between a realistic treatment and a failed VR application that slips into the uncanny valley. Right now, the Fear of Heights application is only available in one specific clinic in Bristol, aptly named (for the Ready Player One fan) Oasis Talk. But Oxford VR has several clinical partners in the United Kingdom and is looking to expand. There are several therapy VR apps available on existing app stores, including Higher than Heights by Mahama’s VR and Co. For $12.99, it offers a “new strategy for overcoming fears, phobias, addictions,” but can also be “used for enhancing sports results” according to their website. Similarly, the $4.99 Fearless app has been on the Oculus store since 2016. Developer Tim Suzman says it cured his fear of spiders after “just two hours of immersion in the trigger-infested simulation.” As of Dec. 2016, Suzman had raised $650,000 to expand Fearless beyond spiders to tackle entomophobia (fear of insects) as a whole, and the Fearless app has since added sections for cockroaches, bees, and wasps. VR will be “the most impactful technology ever for mental health,” says William Hamilton, Mimerse co-founder. The company’s website mentions a number of upcoming products, including VR experiences to tackle the fear of public speaking and flying, pain distraction, and arachnophobia. It does not mention Itsy, however, since Itsy is not quite ready for primetime, Hamilton says. In the end, Fear of Heights stands out from the crowd. Many app-based therapies rely on exposure therapy, which means the participants experience fear until their body runs out of adrenaline and essentially stops being afraid. Fear of Heights, and Oxford VR’s other programs are based on more general cognitive behavioral therapy (which includes exposure therapy) to get patients to consider how their thoughts are related to their physical actions. This helps them break down their feelings about a phobia so they can more adequately challenge it in their day-to-day lives. As such, Oxford VR encourages patients to talk with a real-life clinician with the expertise to discuss the patients’ reactions, rather than the one-size-fits-all approach offered by programs on the app stores. Then VR can fill in any gaps the clinician does not address. Used alone, VR could potentially be isolating for those who really need more extensive therapy. For the time being, virtual reality is a tool, not a cure, for what ails us. That’s not to say that you won’t ever find Oxford VR’s programs on mainstream app stores, though. As a part of the NHS, Oxford’s programs are regulated; they must pass clinical trials and research must be published—a much more arduous process than simply uploading an app online. 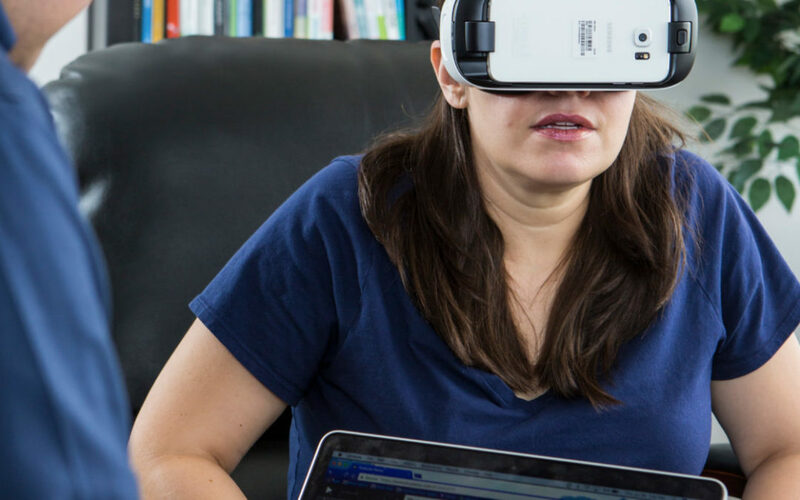 But as the companies like these grow, virtual reality becomes more accessible, and more programs can be made available in the home under a trusted, federally certified name, it’s possible that treatments in a virtual world can prepare patients for the real one.